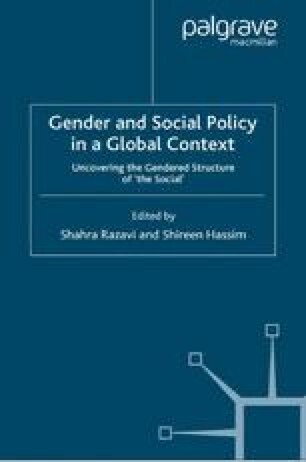 In Latin America as elsewhere in the world, gender bias and masculine prerogative have prevailed in social policy as in social life more broadly, with entitlements resting on culturally sanctioned and deeply rooted notions of gender difference and patriarchal authority. These have generally accorded with idealized assumptions about the asymmetric social positions occupied by the sexes with male breadwinners and female mother-dependents receiving benefits according to these normative social roles. Such assumptions have proved remarkably universal and enduring even where, as in Latin America, gender divisions have been modified by women’s mass entry into the labour force and by equal rights legislation. Skoufias, Emmanuel and B. McClafferty (2000). ‘“Is Progresa Working?” Summary of the Results of an Evaluation by International Food Policy Research Institute (IFPRI) and Food Consumption and Nutrition Division (FNCD)’. Discussion papers No. 118, Washington DC, at http.//www.ifpri.org.